College financial aid is not like negotiating with a car dealership, where bluff and bluster will get you a bigger, better deal. Appealing for more financial aid depends on presenting the college financial aid office with adequate documentation of special circumstances that affect the family's ability to pay for college. 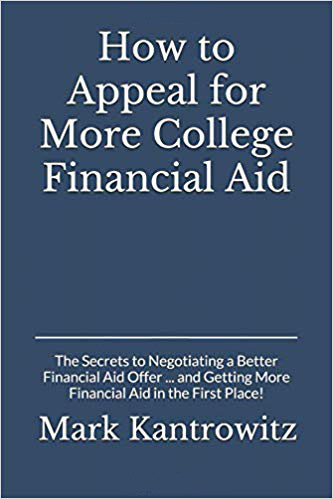 This book provides a guide for students and their families on how to appeal for more financial aid for college and how to improve the likelihood of a successful appeal. This book also discusses techniques for increasing eligibility for need-based financial aid and merit aid. Download a free tip sheet about how to appeal for more financial aid for college. Nobody knows more about paying for college than Mark Kantrowitz. This what-to-expect-when-you're-accepted guide shows you the steps to take if your kid gets into college, but the financial aid isn't enough. Kantrowitz breaks down the aid appeals process in his detailed and results-driven way, to give families a second shot at paying for their first-choice college. Any parents who want to appeal a disappointing financial aid award should buy this excellent, authoritative book before reaching out to any college to boost an aid package. The knowledge gained could save a family many thousands of dollars. Mark Kantrowitz is the absolute guru on all things financial aid. This book can help students and their parents determine when and how to appeal for a better financial aid package, and when it's not worth their effort. Mark Kantrowitz has always been the recognized authority on student financial aid. His latest book is what every college-bound family needs. It is comprehensive, easy-to-understand, and full of practical advice about getting money for college. Read it before filing the FAFSA to make sure you get the most aid. Then use his inside tips to help you increase the aid package, if possible, after you get the financial aid award letter. Mark Kantrowitz offers a comprehensive study of how specific circumstances — including job loss or divorce — may influence an appeal for more financial aid. His trademark is a sophisticated, pulls-no-punches approach toward the financial aid process. His dedication and decades of expertise shine a light on what is realistic, and what is not, when it comes to making your case for more financial aid. Having a clear, unbiased guide such as what is offered here can be extremely useful when it comes to reviewing financial aid offers, deciding whether to commit to an early decision, and even considering where to apply. No one understands the college financial aid process better than Mark Kantrowitz. He has spent more than 30 years immersed in the intricacies of financing a college education. Kantrowitz has been an invaluable source for me as a financial writer reporting on college planning and financing. In his new book, How to Appeal for More College Financial Aid, he provides that service for the many families navigating the daunting, complex process of financing a college education. For every student and parent who has ever asked — "Can I negotiate for more college financial aid?" — the answers are here. Mark Kantrowitz, a true expert on student finance, knows all the rules. If there's way for you to qualify for more money, you'll find it here. Highly recommended. Negotiating an increase in the financial aid package can be a huge lift for a family's finances. But with a success rate of 1%, applicants need a book like this to improve their chances. How to Appeal for More College Financial Aid guides you through this little-understood process. This one-of-a-kind book explains how to increase eligibility for financial aid, identifies errors that thwart applicants and tells you how to write an effective financial aid appeal letter. Families often think financial aid offers are either set in stone or that they're as negotiable as a car purchase. Neither view is correct, but until now there's been no guidebook to appealing financial aid offers that was based in facts and data, rather than anecdotes or wishful thinking. Fortunately, financial aid expert Mark Kantrowitz has produced a definitive guide that will help families understand the financial aid process and maximize their chances of success when appealing an offer that falls short. I've always loved the idea of doing a ton of homework to reap a healthy college financial aid package. Since I hate the idea of loans, getting grants, scholarships and tuition discounts is the way to go. Few know more about this subject than Mark Kantrowitz, author of How to Appeal for More College Financial Aid. Mark has been on the front lines of this little-known battlefront for years. The book is chock-full with both simple and sophisticated insights for anyone interested in learning more about how to squeeze as much money out of a college as possible within the framework of the law. That would include students, parents and financial aid advisers. I myself am �finding tremendous value in the book as I try to help my 19-year-old stepson from a former marriage secure a good �financial aid offer. ... Five stars.